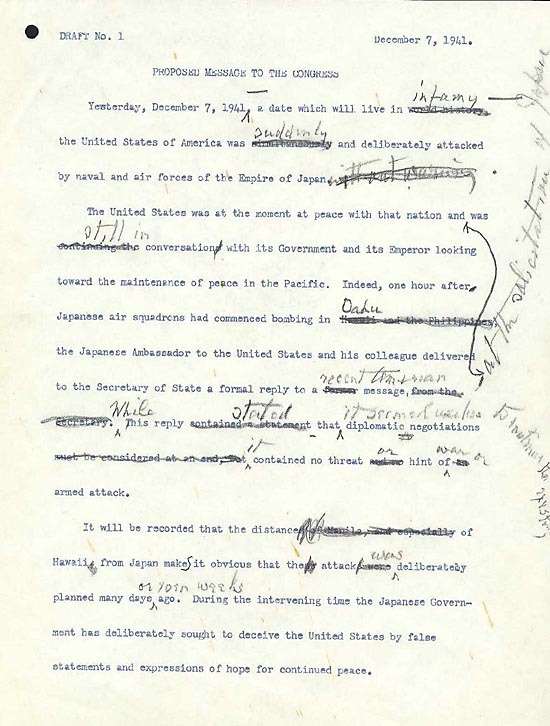 Yesterday, Dec. 7, 1941—a date which will live in infamy—the United States of America was suddenly and deliberately attacked by naval and air forces of the Empire of Japan. We have already seen that Sidgwick’s principle of universal benevolence requires us to give no more weight to our own interests than we give to the similar interests of everyone else. Such a principle is unlikely to have been selected for by an evolutionary process; on the contrary, it is exactly the kind of principle that you would expect evolution to select against, because evolution selects for principles that confer advantages on us, our kin, those with whom we are in reciprocally beneficial relationships, and perhaps other members of our small tribe or social group. The need for reciprocity and trust within our social group may well have led to the evolution of a sense of fairness, but the impetus to extend that sense beyond our own group is unlikely to be an evolved automatic response. It is more likely to require the use of our ability to reason. Our reasoning is, of course, a product of evolution, for it enhances our prospects of surviving and reproducing; but it also brings with it the ability to understand things that have nothing to do with evolutionary fitness, such as the ability to do higher mathematics. Perhaps it also brings with it our ability to see that our own interests are no more significant than those of other beings who can enjoy life as much as we can, and can suffer as much as we can. If this is right, the rational basis of Sidgwick’s principle of benevolence is immune from evolutionary debunking arguments, and hence remains standing when these arguments undermine the grounds for accepting non-consequentialist intuitions.